As it all started as a wedding gift, what better name than the church where we were married. 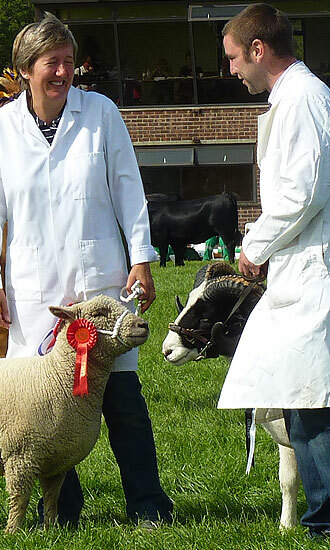 Our starter flock consisted of two pedigree Jacob shearling ewes, Tinkerbelle and Bella along with pedigree Jacob tup Softy, all from Trish Baker’s prize winning Woolpit Flock. So we embarked on our new adventure as Pedigree Jacob Sheep keepers; Softie, Tinksy and Bella were the start of many new experiences for us……Trying to catch them was the first! Shearing was another and the mind boggling shampoo, brush and trim for shows was an eye opener. We have had much fun learning about our flock, good husbandry, getting ready for shows, shearing and so forth and I am pleased to say with much support around us, we are growing in confidence, ability and sheep. After spending time at Christmas Hill Farm (Lakenheath) Craig decided he enjoyed working with the cattle, so when the opportunity arose to purchase a single Red Poll we jumped at the chance. Knowing cattle are a herd animal it only seemed right to purchase four more Red Poll’s from local breeder Mr Rackham as companions for Lady Lavenham Catrin. In order to ensure that The St Mary’s Herd had a future, a stock Bull Canute Cromwell was purchased from breeders N.P Foster & Partners from the Suffolk show (2nd place) in 2011.